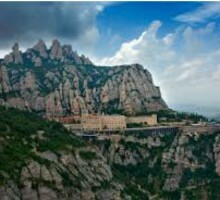 Montserrat#The Royal Basilica at altitude of 1.235 m.
Montserrat, a craggy mountain outside of the city that is home to a Benedictine abbey that houses La Moreneta, a 12th-century statue of a black Virgin Mary patron saint of Catalonia. 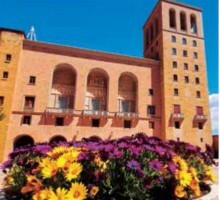 Start the journey from Barcelona in a comfortable coach to the municipality of Cardona where is sited the old Salt mine. 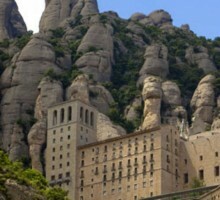 The Mountain of Sal of Cardona is a diaper that grows every year, occupying a depression of the terrain with elongated ellipse shape with an area of ​​1,800 m long by 600 wide and an area of ​​100 hectares, with natural characteristics that have it a fact deserving to be included in the Plan of Spaces of Natural Interest of Catalonia. 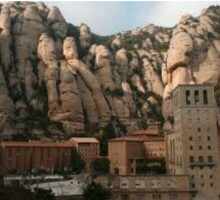 After passing through several of the province's picturesque villages, we reach the incomparable Mount Montserrat, rising majestically to a height of 1235 metres above sea level to the right of the River Llobregat. 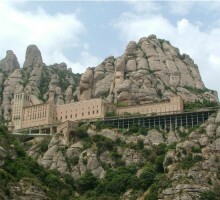 Montserrat, a craggy mountain outside of the city that is home to a Benedictine abbey. 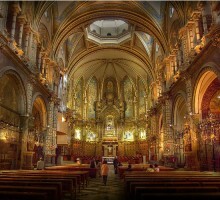 In the afternoon we will leave Montserrat and head to Sant Sadurni d'Anoia, the center of Spain’s cava country. 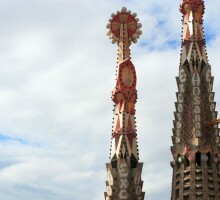 Group excursion: Official Tourism Guide + coach + afternoon rack train. 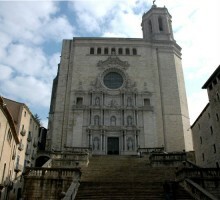 Enjoy the best experience in two differents cities plenty of culture to discover!